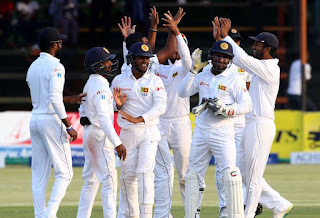 Sri Lanka won the 1st test match played with Zimbabwe at Harare yesterday by 225 runs. Zimbabwe’s day-long resistance ended seven overs from the end of play for Sri Lankans to grab victory. Electing to bat first Sri Lanka posted 537 in the first innings and bowled out Zimbabwe for 373 to gain a 164-run advantage. In the first innings Kusal Perera and Upul Tharanga scored identical knocks of 110 each while Kaushal Silva hit 94. Opener Dimuth Karunaratne scored 56 in the first innings and followed his form with a brilliant knock of 110 in the second innings. Sri Lanka declared their second innings at 247-6 after extending their lead to 411 leaving 98 overs to bowl out the hosts, who were set a target of 412 to win. Dilruwan Perera and stand-in skipper Rangana Herath took three wickets each with Perera bowling out tail ender Chris Mpofu in the 91st over of Zimbabwe’s second innings to clinch victory despite a gallant knock by captain Graeme Cremer, who followed up a first innings century with a stubborn 43.